Driving out of Rome is a terrifying experience. There are hordes of commuters riding scooters into town as we are departing the city and heading towards Tuscany. They don’t care what lane they are in. In fact many of them seem to be headed right towards us. I wonder about the accident statistics in Rome, and hope that I am not going to increase any percentages. We are in somewhat of a hurry. We have a reservation for lunch at Antica Osteria da Divo in Siena, which is about three hours away. 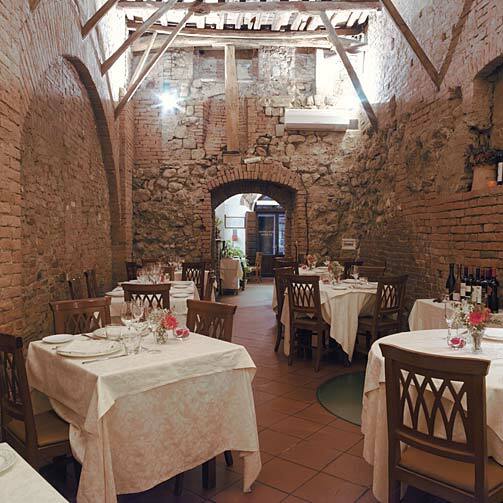 The restaurant dates back to Etruscan times and is entirely carved from stone. The narrow streets of Siena are almost impassable by car. My husband drops me off so he can park, because I am anxious about being late for our reservation. He shows up minutes later, proudly exclaiming that he has found a perfect spot for the car, located outside the large duomo in the center of the town’s piazza.Can this be legal, I wonder? I decide to turn my attentions towards lunch. This is our first meal in Tuscany. Our first bite is representative of true Tuscan bread. No salt. The Tuscans believe in tradition, and back in the day salt was expensive so they didn’t use it in bread. This is a tradition that I think is worth dropping, as it makes for some very dull bread. 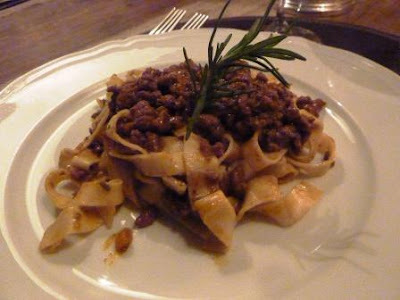 However, the rest of the meal is the best of what Tuscany has to offer. 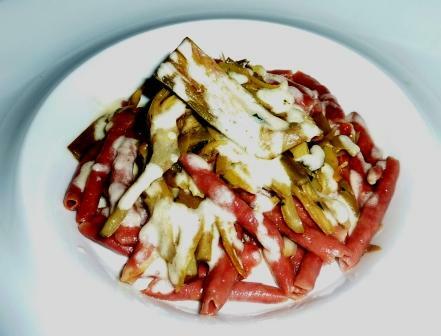 Delicious pecorino cheese from Pienza, the freshest of vegetables, and chewy pasta. My husband’s risotto dish is actually poured into a huge form of pecorino cheese. 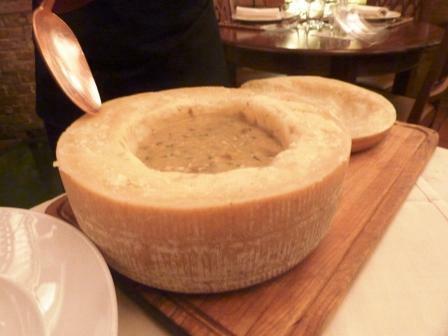 The server scrapes the side of the cheese into the risotto, creating wonderful sticky strands of melted cheese. It is at this point in the trip when I realize that having wine with lunch is mandatory. Italians put food and wine in the same category, and we must do the same. One cannot be enjoyed without the other. (When in Rome….or Siena as the case may be.) I am not terribly picky about wine, which is probably not a great thing for a food blogger to admit. 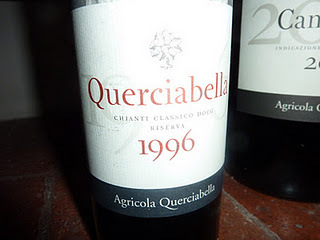 We are introduced to the Querciabella Chianti Classico, which provides a perfect balance between quality and value. This is my go-to wine for many upcoming meals. We finish an outstanding lunch and wander around the beautiful streets of Siena. I suddenly remember that friends recently had their car towed in Siena and we are clearly in an illegal spot (although I find out later they were in a different town entirely). I absolutely panic that our car will be towed as well, so we race directly back to the car. Well, not quite directly. My panic does not supersede my desire for a quick scoop of gelato. The car is miraculously still there, and we head to Greve in Chianti, where we will stay for the next two nights. The scenario along the way is breathtaking, but as we get closer to our villa the winding roads affect my sense of security. The roads are narrow and you must trust that you will not be hit by an oncoming car. 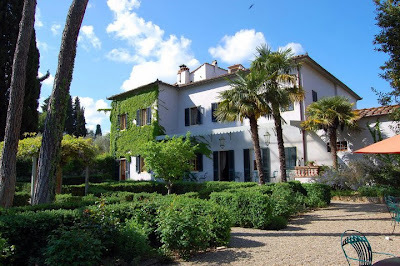 I am a bit shaken by the time we arrive at our destination, Villa Bordoni. For anyone who is travelling to Tuscany, Villa Bordoni is a must. We happen to share a surname with the owners, Catherine and David Gardner. They have done an amazing job in restoring this 16th century villa, which has been featured in Condé Nast Traveller’s “60 Best New Hotels in the World” (2006), and “Top New Hotels in the World” (2007). 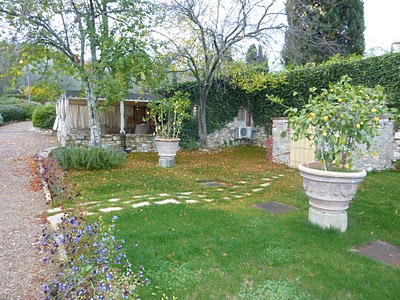 It was also published in Travel & Leisure’s “Tuscany’s Best Hotels” (May 2008). No stone had been left unturned in terms of amenities and decorative touches. The staff is gregarious and welcoming. My only regret is that we didn’t stay longer. 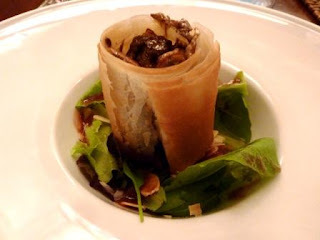 We have dinner reservations at Ristoro Di Lamole, which is also in Greve in Chianti. It is a destination renowned for its view as well as a tricky location. There are more treacherous roads ahead, and it is made worse by a light rain. When we arrive it takes me a few minutes to unwind from the road’s twists and turns. Initially, we are the only diners in the restaurant, although later we are joined by a gentleman from Canada. The situation could be awkward, but our server is a delightful conversationalist, and we have her undivided attention. I am not particularly hungry but I am not going to waste an opportunity to sample the food, so I order a traditional Tuscan vegetable soup called ribollita and some pasta. I am remarkably able to finish both dishes. 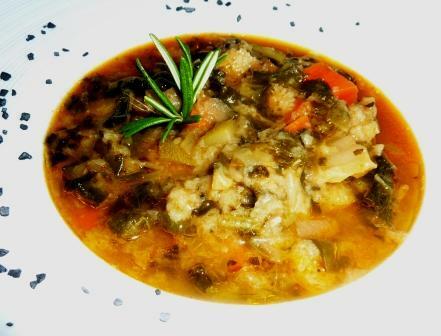 The food is quite good, but my enthusiasm for Lamole is dampened somewhat by the weather and my lack of appetite. This is a place where I wish I could make a return visit. It is pouring rain as we head back onto the challenging roads. It is amazing how a couple of glasses of wine (for me, not my husband who is driving) makes the ride home much more tolerable. 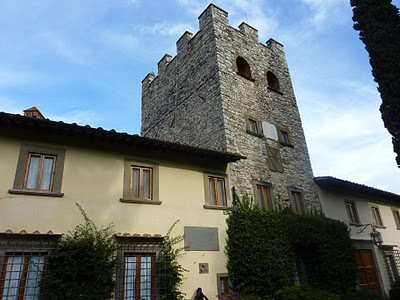 We begin the day touring the Castello di Verrazzano winery. 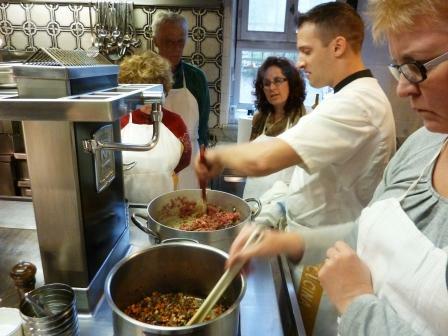 Our afternoon and evening is a highlight of the trip- a cooking class at theVilla Bordoni cooking school. We are joined in the kitchen by two other American couples. Colin, the chef, in true chef fashion seems a little intense at first. But throughout our nearly three hours together we learn some valuable lessons as Colin imparts his extensive knowledge of Tuscan cooking and his own ways of adapting traditions (which thankfully includes adding salt to the bread). The key to Colin’s cooking is what makes Tuscan food so delicious- ingredients that are simple, fresh and local- including fresh olive oil. It is a bright green color unlike anything I’ve ever seen, and adds a distinctive flavor to the food. 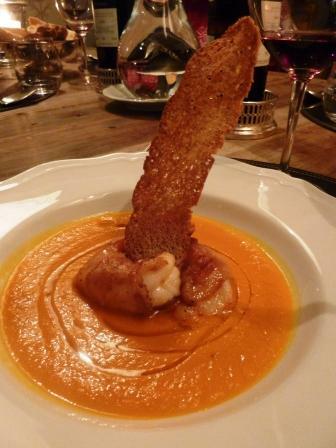 The pumpkin soup is not made from pumpkin as we know it here. It is a more like a very large squash. Colin added the shrimp and crispy topping, which gives it finesse. The secret to the friscassee is in the slow cooking. 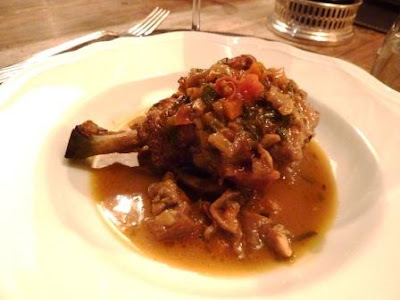 It’s browned on top of the stove and then cooked in the oven for hours, resulting in moist fall-off-the-bone chicken. My “classmates” mix dough for pasta, cut and roll it, while others work with the bolognese sauce. Since I don’t have a successful history when it comes to pasta-making, I keep my distance. We take turns making layers for the tiramisu with the biscuits and freshly made whipped cream. 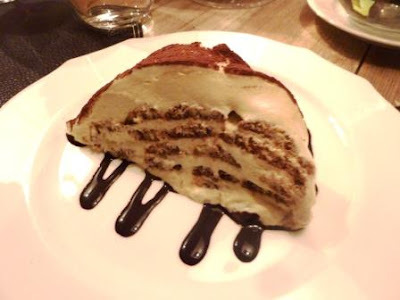 I usually shy away from eating tiramisu as I find it has a chemical taste. The secret is not too much rum. This is the best version ever. I plan to try making it at home. Our group of sous chefs enjoy a most memorable evening of camaraderie and great food. 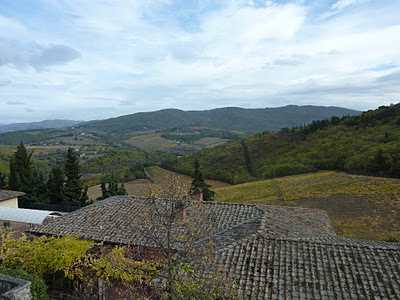 As we head out of Villa Bordoni the next morning, I am more confident in the long and winding Tuscan roads that will lead us to Florence. They have only brought us good things. Which is not to say I don’t breathe a sign of relief when we return the car in Florence, and use other means of transportation for the remainder of the vacation. I’m ready to get back to drinking wine for enjoyment, rather than as a tranquilizer to help calm my nerves. Been there done that X 2…. Looking forward to a third vist. Thanks for the memories!